Would you call yourself a business person? Is it fair to say that you travel often for work? Were you ever asked to relocate? If you said yes to any of these enquiries then it is possible that you have stayed or will stay in Toronto corporate housing. The reality is the benefits of Toronto furnished condo rentals totally out number those of hotels. Here is the evidence: this large one bedroom plus den corner unit is around 825 square feet, hotel rooms are generously around 200. Instead of being cramped in four walls with low ceilings, you can stay at this suite; it offers 10 foot high ceilings and great windows, along with beautiful hardwood floors. Most of the time, the focus of a hotel room is the bed, not here, since there is an actual bedroom with a door which can be shut for privacy. Also in there is a large walk-in closet and a queen sized bed fitted with fine linens. 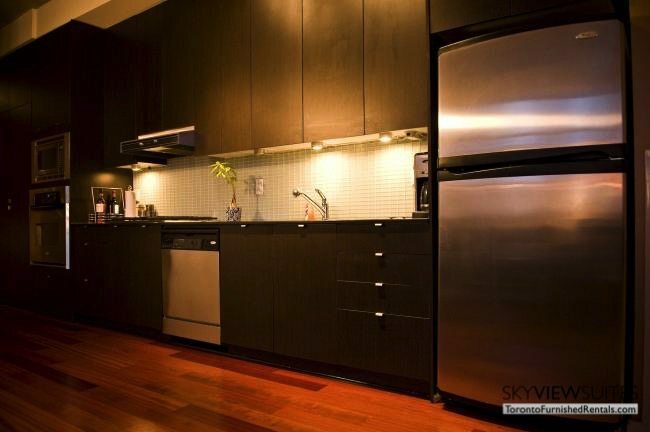 You’d be lucky if you can get a microwave or a mini-fridge at most hotels, though, when you rent Toronto furnished suites you get a fully serviceable gourmet kitchen. 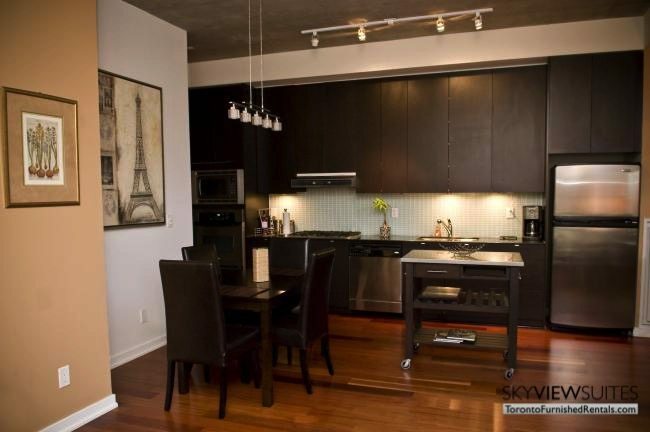 In this unit there are stainless steel appliances, custom cabinetry, and a dining table which can seat four. Not to mention, everything you need is at hand, from knives to glasses and more. That sure beats plastic cups and room service, don’t you think? As far as the den goes, it is semi-enclosed and can be used for additional sleeping accommodations. Another benefit of using Toronto corporate housing is the en-suite washer and dryer, and bi-weekly cleaning service which refreshes your linens and luxurious towels. Free wireless internet and cable TV come standard with your rental. The amenities at this building include a central courtyard with reflecting pool for cool dips, as well as an indoor pool and sauna. There is a conference center ideal for business meetings or for quiet work time. For social gatherings there is a party room and lounge, and for entertainment there is a private cinema, and billiards room. And finally, for your peace of mind, there is round the clock concierge available as well. 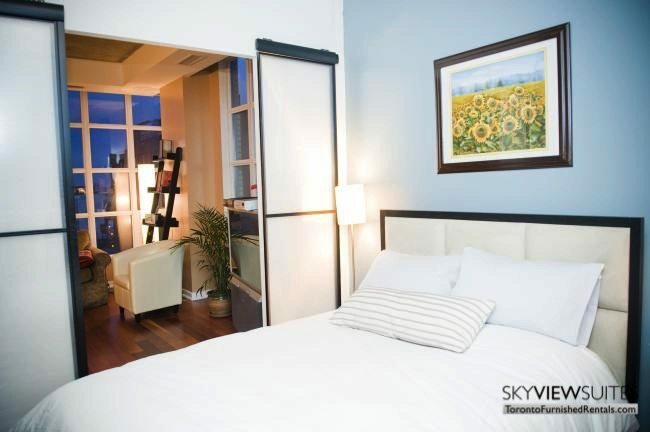 This urban loft building is located in the downtown core and is surrounded by easy access to transportation. In a short less than five minute walk you can reach the closest subway station. Readily accessible at this location is Toronto’s underground PATH system, a subway stop, a front door streetcar stop and convenient highway access. 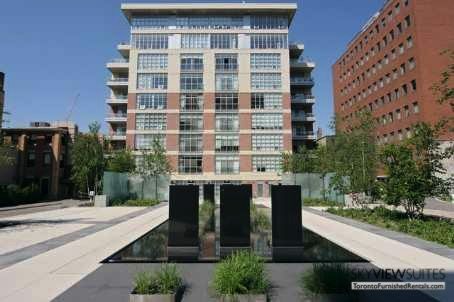 Situated in the King West/Queen West district, this condo is just steps away from some of the finest restaurants in the Toronto. The Quad Lofts fuse flawlessly with Brant Street charm and sophistication.